Iron Gall inks have come a long way in the past ten years, and I’ve been really impressed with KWZ’s iron gall inks so far. Let’s take a look at KWZ Iron Gall Turquoise. 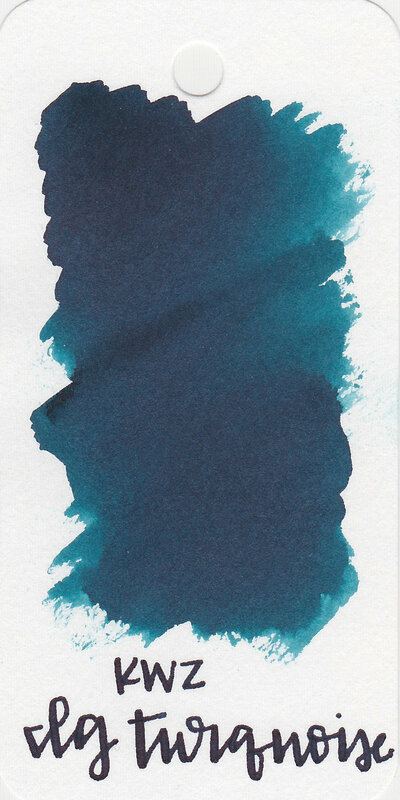 IG Turquoise is a dark blue with a green undertone. The ink dries to almost black, it’s not sheen but has a shiny finish. IG Turquoise is similar to Krishna Monsoon Sky. Click here to see the KWZ inks together, and click here to see the blue inks together. I used a Pelikan M805 Stresemann with a medium nib on Tomoe River paper. The ink had a wet flow. Overall, this ink goes a bit against what I know about iron gall inks. In my experience iron galls are a bit dry, but this one is wet, and they tend to be more water resistant, and this one only has medium water resistance. It does dry quickly, similar to other iron gall inks. I didn't have any flow issues, and it’s well behaved. I was constantly surprised by the vanilla smell every time I wrote with the ink, the smell seemed a bit stronger than the other KWZ inks I’ve tried.